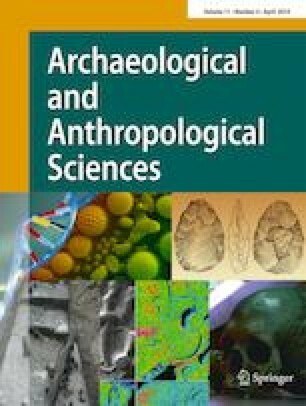 This paper presents the chemical and isotopic analyses of glass from the first century CE excavated in Dibba (United Arab Emirates). The elemental composition was determined using inductively coupled plasma-optical emission spectrometry (ICP-OES) and micro-X-ray fluorescence (μXRF), as well as the isotopic composition using laser ablation-multi collector-ICP-mass spectrometry (LA-MC-ICP-MS) for Sr and solution MC-ICP-MS for Nd. This study revealed the unique elemental and isotopic composition of this material, matching the local geology and providing a strong argument for a previously unknown production site, possibly local, for this material. Two glass hues are observed in the assemblage (green and amber); both have the same chemical composition. The colour difference is due to differences in the oxidation state of the chromophores whether or not purposefully is unclear. The production of blown glass vessels shows a technology, not yet evidenced before, for this period in this region. The online version of this article ( https://doi.org/10.1007/s12520-018-0611-0) contains supplementary material, which is available to authorized users. The authors are thankful to the Emirate of Sharjah for providing the samples for analysis. The authors are also thankful for the helpful comments of the reviewers which have contributed to the coherence and thoroughness of the paper. Alicia Van Ham-Meert is funded on a project from the Flemish research fund (FWO) with number G.0C43.15. Philippe Claeys is thankful to Hercules for funding the purchase of the μ-XRF.